Awhile back someone posted a comment reminiscing about the days they spent in Namu, BC as a child. Namu was a seasonal fishing community located just south of the entrance to Burke Channel - on the eastern side of Fitz Hugh Sound in Namu Harbour. Namu was established as a salmon cannery by Robert Draney (long time Central Coast and Bella Coola pioneer family) in 1893. It's about 60 miles by water from Bella Coola. It ran as a cannery until the early 1970's. The beginning of it's downfall was the improving technology in icing and chilling salmon which made it much easier to ship salmon to either Prince Rupert or Vancouver for final processing. 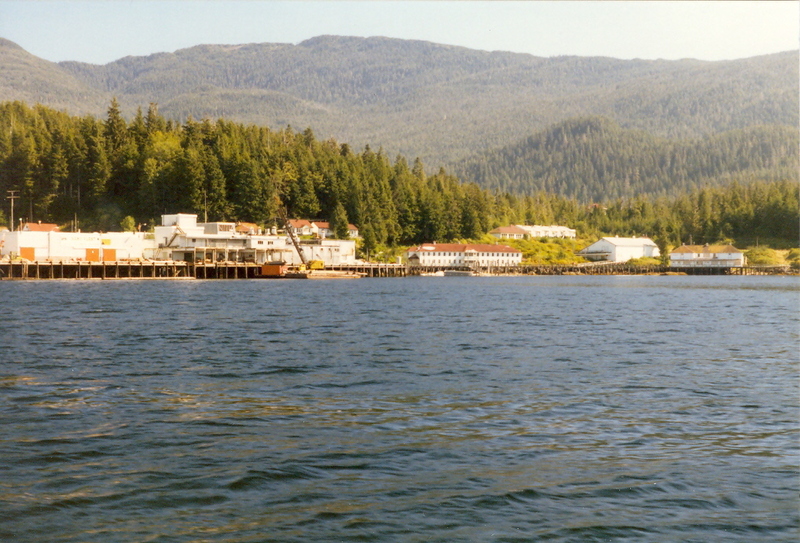 The cannery was closed and from 1970 until the late 1980 or early 90's served as an ice supply location and transfer station for all sorts of fishing - salmon troll, gillnet and seine and groundfish such as halibut. It also operated for many decades up till the 60's as a herring reduction plant - in the days when Pacific Herring were fished only for their oil and by product fish meal (now they are fished for their roe). I was lucky for the first part of my career to spend many days in some of the biggest salmon fisheries on the Central Coast working in that area. The lady who posted a comment only barely scratched the history and memories of thousands of people of this place in the 100 years of it's existence and it's pre-existence as a First Nation settlement. In its day it was a huge hub of activity from March to September when it was operated by BC Packers. It had a completely stocked grocery store, extensive commercial fishing tackle and marine hardware, marine repair yard, machine shop, ice plant, liquor store, jail, administration offices, workers and managers houses, docks, float plane docks and so on. My favourite place was the restaurant, after spending a number of days on a boat in the summertime, to go there and have a Namu hamburger and an ice cream cone, was pure heaven. Namu is also important for something else - archaeologically it's widely recognized as the area with the oldest and longest continuous human habituation on the BC Coast, with an established record of First Nations occupation going back to 11,000 years ago - right to the point when the ice was retreating and the land on the inner coast starting to rebound from the weight of the ice. It's a natural and strategic spot, rich in seafood in the surrounding area and a key point in coastal movement whether before European contact or after. I really enjoyed learning more about Namu,the mechanic I use in 100 Mile House spent some time living there years ago and knowing we go down to the Valley often he was telling me about time he spent there.Enjoyed seeing the pictures and reading the info .I look at reading your postings almost like a daily trip to the valley.I always look forward to seeing what you will post for a picture or what you will write about next. Thanks for posting this. My brother uploaded a bunch of images from the time we lived there 52 -60 and then some of when he worked there as a teenager in the summers. Our dad worked there as the town electrician from 51 till he died there in 60. My brother took a boat trip journey up there, a couple of years ago now, with some family and friends to look at it once more. He also posted some photos of this trip on the Namu facebook site. It was so sad to see its fate but then again, sometimes nature takes over and make right all the destruction we do. There are still some weirs at the mouth of the river. We contacted SFU as some of the info they had on Namu was no correct. They responded but oddly, they haven't corrected it yet. Thank you for posting this! I am compiling a large report about Namu and any info I can get helps!